They are small, sturdy cats that are grey/brown in colour with vertical stripes on their upper back, spots on their sides and bands around their tail and legs. They are very agile and their long tail is important to help them balance when moving around on rocky terrain. Andean Cats can be found on the dry, rocky slopes of the Andes Mountains in South America. They live above the timberline at altitudes between 3,000 and 5,000 m (9,840 - 16,400ft). Andean Cats feed on rodents, reptiles, birds and rabbits. Their main prey are mountain chinchillas and mountain viscachas and they will carefully search under and around boulders to seek out their prey. No information has been documented about reproductive behaviour in Andean Cats. It is thought that they reproduce once a year and they have litters of 1 - 3 youngsters. 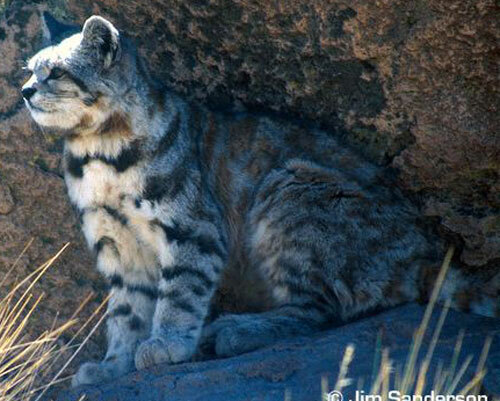 Andean Cats have no known natural predators. There are no subspecies of the Andean Cat. There are thought to be less then 2,500 individuals in existence.